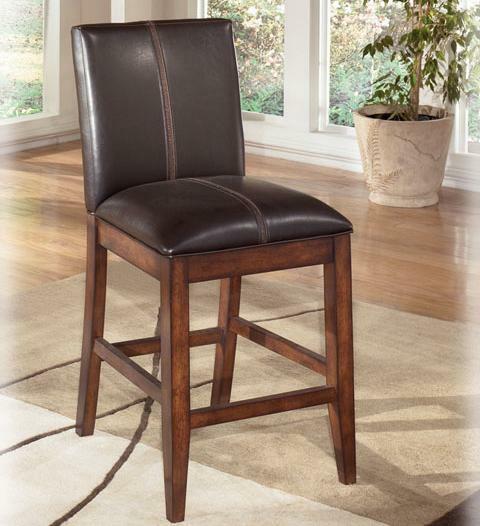 This faux leather upholstered bar stool with strong horizontal back is supported by four tapered wooden legs. These chairs are constructed from select veneers and solid hardwoods. The Larchmont 24" Upholstered Bar Stool by Signature Design by Ashley at Michael's Furniture Warehouse in the San Fernando & Los Angeles area. Product availability may vary. Contact us for the most current availability on this product. The Larchmont collection is a great option if you are looking for Casual furniture in the San Fernando & Los Angeles area. Browse other items in the Larchmont collection from Michael's Furniture Warehouse in the San Fernando & Los Angeles area.